The Beelzebufo (bee-el-zeh-boo-fo) is one of the creatures in ARK: Survival Evolved. It is found in the Swamp Biome, and can almost jump the highest in the game second only to the Procoptodon. Beelzebufos also naturally create Cementing Paste when they consume small insects (Titanomyrma and Meganeura). Beelzebufo palucocus is the largest frog I've ever seen. Almost impossibly large, it can actually fit a fully-grown human adult on its back, though just barely. This is a dangerous prospect, though, as secretions from Beelzebufo's skin and saliva have a narcotic effect on most creatures. Not surprisingly, Beelzebufo is adept at killing insects. Its lengthy tongue allows it to quickly grab prey from afar, killing most insects near instantly and quickly digesting them. It even combines the narcotic chemicals in its mouth with the insects' chitin to create a specialized sticky substance. Tamed Beelzebufo make for strange mounts. Strange mounts for strange people. Many tribes don't believe there's any reason to ride them, but some enjoy the ability to take large vertical hops up huge walls and cliffs. Regardless of how it is ridden, Beelzebufo is also employed for its ability to quickly cull insects, and convert them into always-useful cementing paste. Beelzebufo spends its days hopping about in the swamps. However, if attacked, it will fight back fiercely, lashing out its poison-laden tongue at enemies. Beelzebufo is an enormous frog, larger than a man and (once tamed) strong enough to carry one on its back. Short spines protrude from its back. It is an effective ambush predator of the island's large insect species, sedating its prey before stuffing it into its wide mouth. This section displays the Beelzebufo's natural colors and regions. For demonstration, the regions below are colored red over an albino Beelzebufo. The colored squares shown underneath each region's description are the colors that the Beelzebufo will randomly spawn with to provide an overall range of its natural color scheme. Hover your cursor over a color to display its name and ID. For example, "cheat SetTargetDinoColor 0 6" would color the Beelzebufo's "body" magenta. The standard procedure with tranquilizer arrows works just fine. However be careful as its attack has a long range and can tranquilize you. Standing on top of a large rock can protect you from this. Beelzebufo can be picked up with a tamed Argentavis and dropped into a taming pen. Since it only attacks horizontally, you can shoot it on a platform and you will be safe from its attacks. This section describes how to fight against the Beelzebufo. Beginners should not take the Beelzebufo lightly! Do not attack the creature on impulse. Often, beginners tend to swipe at them with whatever they have, since a frog seems like a pretty docile animal. This leads to an untimely death that could easily have been prevented. If one is knowledgeable, they can secure victory early on, or even tame this useful animal. A good strategy to fight them is from above, because their attack only hits the area directly in front of them. Ranged weapons can reach further than it's tongue, but it can close distance very quickly. In some cases, rushing it may be the best course of action. Eat stimberries if your torpor is peaking. Better to use ranged weapons to avoid their torpor-inducing attack. They can knock you out easily with their torpor-rising attacks, and can jump and swim very fast. look out for other creatures in the swamp. The incidental backpedal into a pool of megapiranha can kill a player quickly, as the beelzebufo can knock the player out, opening a banquet for the piranha. Titanboas can add additional torpor and eat the player alive, while sarcos ensure no escape on water routes. The poor choice to tamper with a Dimetrodon can be a fatal one, and the unfortunate jab into a Paracer's leg can lead to an unfortunate death via crushing, which can send players through the map on occasion. Beware, beginners! Their attack is mostly horizontal, so it's easy to avoid it by just getting on a rock. They do not have much health either. Pressing the alt-fire button (default rmb) will shoot the tongue out, inflicting Torpor on creatures it hits, and turning dead Meganeura, Titanomyrma, and Jug Bug into large amounts of Cementing Paste. Attacking a bug corpse will yield between 0 and 8 Cementing Paste each, regardless of melee damage. If a Meganeura is flying too high for the Beelzebufo to attack, get off your Beelzebufo and punch the Meganeura. Quickly jump back on the Beelzebufo, the Meganeura should be aggro, and its swarm will follow. Jug Bug can't be killed with low level Beelzebufo. Hostile players may find the Beelzebufo a perfect mount for raiding. It is able to jump over walls easily, and one hit from its tongue is enough to knock a human unconscious. Also, Beelzebufo is a very versatile traveling mount, as it can can jump long distances, does not take a lot of fall damage and its swim speed is good along with the fact it can breathe underwater and its stamina recharges quickly while swimming. Hopper: This creature is extremely adept at covering large distances with its jump. This doesn't use much stamina so it can be used to travel long distances quickly over most types of terrain. This creature will also regain most of the stamina used jumping while in the air (Level Speed). Swimmer: This creature is a strong swimmer as it moves quicker than it does on land and lacks the oxygen stat. (Level Health and Stamina). Cement Factory: This creature can gather decent quantities of Cementing Paste in a short period of time. It also gathers Chitin in addition to the cementing paste. A good tactic is to ride it into the swamp and kill something as Meganeura are attracted to corpses. Once they begin feeding, attack and the swarm will come to you. Level HP and Damage (damage will not increase the Cementing Paste received, but will increase your survivability against a swarm). Raiding: This creature is quite adept at raiding. It's able to make quick escapes, raid higher level bases by overcoming higher walls, and its tongue attack can quickly tranquilize enemy survivors in quick succession (Level Health, Melee Damage, and Speed). Taming: This creature's tongue attack makes it a great tool for knocking creatures unconscious, as it also deals minimal damage. It can also be used as a last resort for keeping a creature's torpor high (Level Health, Melee Damage, and Speed). Leech Farmer: It appears that Leeches do not agro on tamed Beezlebufos, so this makes them great for harvesting Leech Blood. Dossier released on August 12, 2015. Its name means "Lord of the Toads", from Beel, the Hebrew form of the Ugaritic word Ba'al meaning "lord", and Bufo, a large genus of toad. Often confused with Beelzebub "Lord of the Flies." 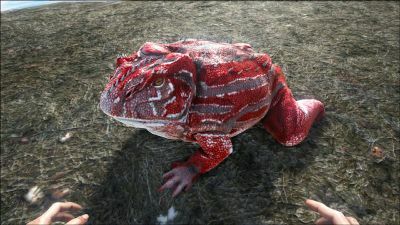 While the in-game creature Beelzebufo palucocus is big enough to be ridden, the real-world Beelzebufo ampinga only reached around 50 cm in length. Though there were other frogs large enough to dwarf a medium-sized dog. Their tongue attack can only travel horizontally. When attempting to knock one out, stand on top of one of the large rocks that are abundant in the swamp and shoot it from there with a Slingshot or Tranquilizer Arrows. The Beelzebufo can be picked up by an Argentavis. Be careful when attacking large quantities of Drones or Titanoboa with the Beelzebufo. Its low base health makes it highly vulnerable to damage. The Beelzebufo, despite not having the highest movement speed, is quite possibly the best form of transportation on The Island, aside from flying mounts. 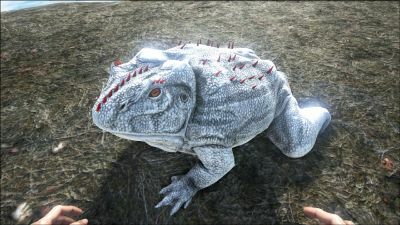 Its ability to jump long distances and up cliffs makes it a good animal for traveling a distance on. Beelzebufo will only mate in water and their eggs are aquatic. As of Mobile v1.0.95, Beelzebufo will drop Frog Legs, which can be used to craft Frog Feet. If you use an admin blink rifle while riding a toad, you can teleport, still use the jumping animation, and the toad will look riderless.